For several years now I’ve been trying to find a way of keeping on top of everything that I need to get done. To be honest, I didn’t think I had a problem until I read David Allens book “Getting Things Done” (GTD). It was whilst reading that book that I realised that I spend most of my time worry about what I need to get done and what I might be forgetting to do and not enough time actually doing things. I’ve had several attempts at trying to follow the GTD methodology but so far they have all failed and I’ve reverted to just relying on the good ole grey matter to remember what I have got to do. I’ve tried using software to help me – iGTD, Midnight Inbox, OmniFocus, Outlook, iCal, Google Calendar – but the problem with a lot of these is that they are either platform specific (I need my laptop with me) or are calendar based (a lot of what I need to remember is not date specific). Other attempts have been centered around a notebook that I try to remember to take with me. This has inevitably resulted in my failing to remember to take my notebook with me and therefore forgetting to update it what I have it to hand again. As great as this software is shaping up there is one striking feature that I think this app – and all other GTD apps – really needs. Task Locations! So I’ll go out to run some errands, get home and realised there was some else I could have got done because I was in the area but didn’t because I didn;t think of it whilst I was there – if I had a map on my iPhone of tasks in my current location I could get more done in less time. I’m not sure of how the iPhone app UI is going to look for TheHitList but I came up with a (very) rough Photoshop version of what the desktop app might look like. 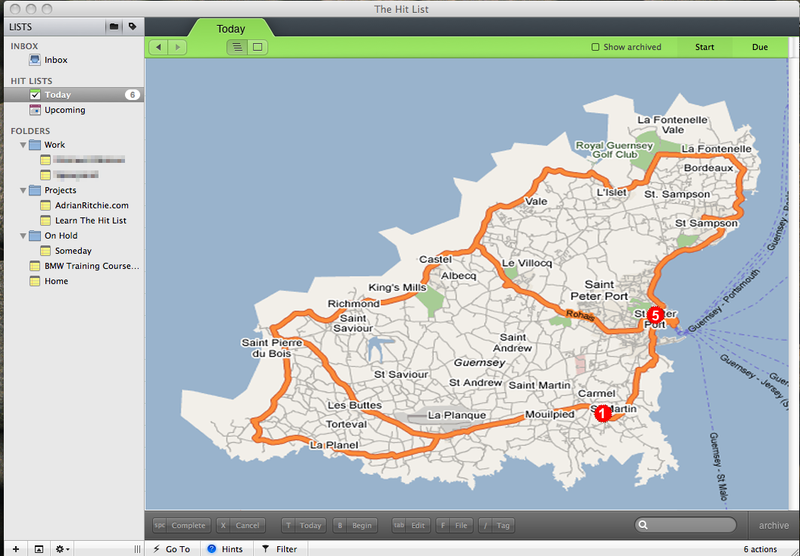 This example is showing the Today list selected and the map with the number of tasks for today on their locations. If you had general list selected it might show the tasks for today in red with tasks in the future fading through to grey for tasks without a specific date. With this type of functionality you’d be easily able to see if you’re going to a location for a specific task whether or not there were other things in the area you could do at the same time. These things would be great if they weren’t so platform-specific; that’s what put me off Midnight Inbox too. I’ve been using Chandler (http://chandlerproject.org/) which is not ideal, but I can make it work and it will sync across all my platforms. @steve: I’ve had a look at Chandler in the past but I’ve not gone as far as to try it. One of the stumbling blocks for me with Chandler is aesthetics. I’m sorry but I just can’t get passionate over the screenshots on the website, they look to cluttered for my tastes. I need something clear, simple and functional. @phil: Hi mate, I have briefly tried RTM for the 15 day iPhone trial but never really got into it that much, certainly not far enough to figure out the location tagging. Now that you’ve pointed it out I’m going to have another look at it. OmniFocus GTD iPhone app has location-aware actions and contexts built in to it already.